Coasters. 4" glass squares. Tatting is between layers of glass. Many colors to choose from. $28 each or four for $95. Sun catchers - one of a kind. Different colors, shapes and sizes as well as different shapes and sizes of tatting, prices vary. 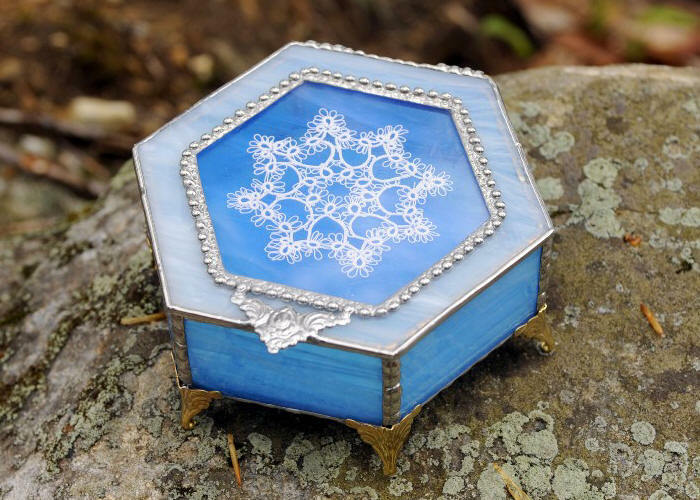 Glass box with tatting between the glass. Many sizes, shapes and colors to choose from. One of a kind, price varies. Framed Tatting in floating frames. Many styles and colors to choose from or special order. Easel or hanging backs. Prices vary. Marble with tatting. Variety of colors of marbles.